Merely 5 miles north on Pontiac Trail, a vision is taking on substance. Tilian Farm Development Center is about to burst forth with active vegetables, animals, and people. As with so many things, it is nice to see a "before" picture, this is that picture. As I noted in January, Tilian Farm Development Center is the larger envelope enclosing the Four Season Farmer Development Program (FSFDP) currently using 16 acres owned by Ann Arbor Township. The Township's acreage extends for 150 acres around an old barn (with a new roof courtesy of the Township) and a crumbling side building. Three inaugural farms will share the land, the resources, and the community's support as the first wave of entrepreneurship under the Tilian umbrella. The purpose of Tilian is to create new farms in our area. As such, there will be a rotation of new farmers coming in new every year on two-year rotations. Andrea Ridgard, Project Manager, shares, "the first year of the program is really focused on getting the farms started and sustainable with their own markets. The energy of the program in the second year will be more focused on the farmers leaving the land and surviving on their own." 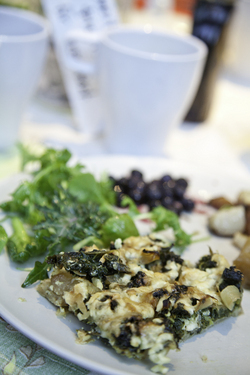 The newest farmers to join the Ann Arbor community served breakfast at Selma Cafe last Friday. From left to right: Ben Fidler, Nate Lada, Alex Cacciari, Mark Nowak, and Jill Sweetman. Of the FSFDP applicants, three farms were chosen as the inaugural cohort. Nate Lada and Jill Sweetman, of Green Things Farm, are starting a small vegetable and egg CSA (memberships available). Alex Cacciari and Mark Nowak, of Seeley Farm , are looking for wholesale customers for their greens. 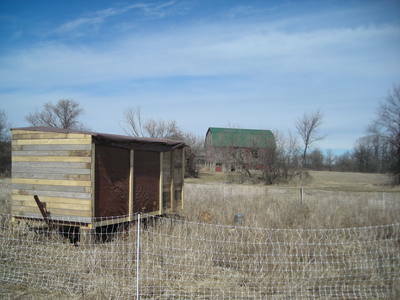 Benjamin Fidler, of Bending Sickle Community Farm, will be doing a pork and poultry CSA. As Nate Lada explained to me when I asked about growing practices - "we are all doing ecologically sustainable practices, using insecticidal soap for example. But we are not going to be certified organic." The young farmers benefit from the FSFDP advisory committee with a broad range and depth of knowledge: Jane Bush (Grazing Fields egg cooperative and Food System Economic Partnership), Tomm Becker (Sunseed Farm), Shannon Brines (Brines Farm), Jennifer Kangas (Capella Farm), Victoria Bennett (WCC), Jeff Holden (Allegiance Health), and Dan Carroll (Zingermans Bakehouse). Fueled by potlucks - the veterans, "volunteer their time," shares Jill Sweetman, "they have given us advice on our seed order, business planning, doing the llc, and financial stuff." Tilian Farm Development Center is guided by a steering committee equally impressive in its knowledge and dedication. Jeff McCabe (Repasts Present & Future and Selma Cafe), Andrea Ridgard, Jeremy Mogheter (MSU Student Organic Farm), Dan Bair (The Farm at St. Joes), Shannon Brines, and Jessica Neasfey (SNRE student and landscape designer). Selma Cafe formed the Four Season Farmer Development Program with funds from a Conservation Innovation Grant from the U.S. Department of Agriculture. The 2 year grant pays for 25 hours of work a week, a mobile hoop house, a washpack (where food can be, you guessed it, washed and packed), a root cellar, and $3000 worth of tools. As such, the farmers have put together a "Tools to Till Tilian" campaign on Kickstarter.com to raise $12,000 to purchase fencing, a tractor, and capital necessities that should last beyond their two years on the land. If you choose not to contribute to the campaign you can help grow more farms in Washtenaw by literally building a hoop house. 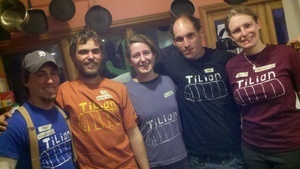 The first hoop build of 2011 will happen at Tilian on April 16th. You can sign up here. The day I visited, the lone chicken coop surrounded by electric fence highlighted the wide expanse of, as yet, empty land. One brave Bantam rooster crowed against the wind and the wilderness. Not for long will he be the only one making noise on that land. In my Farm to Fork series I visit local farms around Ann Arbor and share what I learn. "People aren't willing to just eat potatoes and onions all winter long. 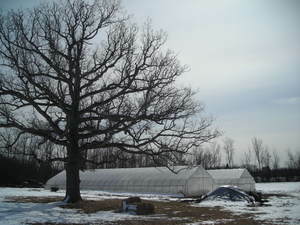 " Tomm Becker, of Sunseed Farm, stands in the one of their two unheated hoop houses surrounded by dark earth and verdant vegetables. "We believe that in order to have a really healthy food system we need to have a year round supply of food. It doesn't make sense to even talk about a food system unless you can supply food in the wintertime." Tomm learned about supplying food in the wintertime as the Production Manager for the Student Organic Farm at MSU. He and his wife, Trilby, moved to Ann Arbor and started - Ann Arbor's first year round fresh vegetable CSA - as noted in the 2011 Local Food Victories awarded at the 3rd Annual Homegrown Local Food Summit. Supplying food all year long takes hoophouses (courtesy of Selma Cafe's Farmer Fund and the USDA), a regimented plan for the timing of plantings, and an awareness of which plants to grow inside the hoop during the winter. As Becker explains: "we grow either plants that you can harvest a bunch of times - like the kale or chard or the salad mix - or the really space efficient crops like lettuce, carrots, or spinach. 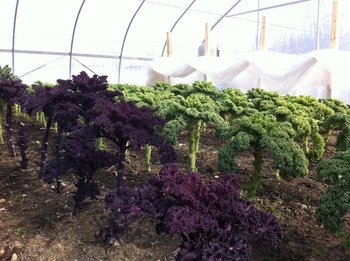 " Kale is very efficient, seeds planted in August have been harvested since November - four months. As their August plantings of salad mix and turnip are bolting they remove them and planting new seeds for the summer harvest. Sunseed Farm uses a variety of methods to control pests and diseases: cover crops, rotational plantings, a broad array of vegetable species, the application of regular dish soap to remove aphids, and spraying nematodes (a microscopic soil organism) on the soil to reduce cutworms. "What we are working to do is to create an ecosystem in which the population of one pest/pathogen/insect is not exploding to the point where it becomes a real problem... [We are] increasing the biodiversity on our farm... to keep the insect pressure down... because when you have healthy soil you can have healthy plants. When plants have what they need they are able to resist attacks." Another way Sunseed Farm protects and thus feeds the soil in the hoop house is by using a broadfork to loosen the soil for planting instead of turning it over with a shovel or tilling it. "[With a shovel] you might achieve a lot really quickly, but you are really setting back the soil biology by killing a lot of the microrganisms down in there...People have been using a broadfork for a long time, but [Eliot Coleman] brought it back." The 30 inch wide bar has 7 long tines - standing on it and wiggling it back and forth loosens the soil without destroying the fragile ecosystem. The first week of March, Tomm Becker presented at both the Homegrown Local Food Summit and at the Michigan Organic Conference. He also welcomes interns and apprentices to Sunseed Farm. "I want to help people as much as I can. I don't really see myself in competition with other small scale vegetable farmers. I think that really what we are doing is trying to change the whole food system - helping each other is helping ourselves." What is the abomination of McDonald's "oatmeal"? 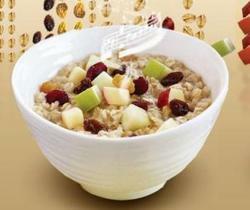 This is the bowl of oatmeal shown on the McDonalds website page - a page that has its own jaunty "oatmeal" tune. Why do we care that McDonalds has introduced "oatmeal" with more calories than their hamburger and with more sugar than a Snickers bar? I put "oatmeal" in quotes because, according to Mark Bittman's How to Make Oatmeal: Wrong, the product should be described as "oats, sugar, sweetened dried fruit, cream and 11 weird ingredients you would never keep in your kitchen." As of Saturday, the article has lived in the top 10 emailed list for The New York Times since it was published on Tuesday, February 22. Apparently, a lot of people care. My question is why? Are they preaching to the choir? Or do people actually think in this day and age there is anything healthy about walking through the fabled double arches? Whether it be SuperSize Me, Eric Schlosser's #1 bestseller Fast Food Nation: The Dark Side of the All-American Meal, or a simple read through McDonalds menu ingredients online. We all know McDonalds is not healthy, yet stories continue to be written, emailed, and commented on - detailing the exact nature of the unhealthiness. Conrad's "the fascination of the abomination" comes to mind, our inability to look away from a train wreck. However, the true abomination is this. Everyone knows McDonalds is unhealthy and people go there because they have no choice. They have no choice, because as Michel Nischan of the Wholesome Wave Foundation put it at the TEDx food conferece, "they can't afford" real food. According to the Fair Food Network, 92% of all Detroit food stamp retailers offer no fresh fruits and vegetables. For an urban food desert like Detroit, and for the rural food deserts in Iowa, the dried fruit in McDonalds "oatmeal" might be the closest a child gets to biting into an apple. That is the real abomination, and worth talking about. 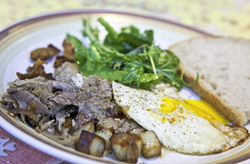 Selma Cafe is a local-foods breakfast salon began in February 2009, founded and hosted by Lisa Gottlieb and Jeff McCabe, organized these pastÂ six months by Gottlieb, as McCabe has focused on the farming initiatives. The first time my husband and I went to Selma Cafe, we arrived at 6:25 a.m. so he could be at work by 7:15. It was dark. It was winter. I could barely believe we were going to be welcomed into a stranger’s home at 6:30 in the morning for breakfast. We entered the glowing entryway and stopped. “What do we do now?â€ I whispered. We could hear voices and smell bacon. A prodigious number of nametags and masking tape adorned the walls –Jim, Mary, Susan, Lynn, John, etc. “Those must be for the people who belong here.â€ I whisper again. Right when I was about to turn around and sprint back to our car in embarrassment and nerves, a greeter bounded around the corner and our introduction to Selma Cafe began. As I wrote in September, hoop houses are being built with the money raised from the breakfast funds. I did not mention the amazing experience one has eating breakfast at the Friday morning Selma Cafe. There is a palpable energy of good cheer and community. 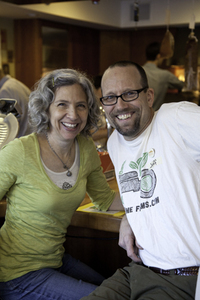 I watched Lisa Gottlieb and Jeff McCabe this past Friday clearing dishes, answering questions about the laying habits of their chickens, extolling the prowess of masseuse Ed Weymouth (offering complimentary massages to those waiting for a seat) to first time eaters to the cafe, sitting down with participants, laughing and smiling at the community centered around their kitchen. It is a remarkable gift they are giving to our community. Because in contrast to my first trepidation as I viewed the entryway nametags, the legion of names on masking tape illustrate an important precept of Selma Cafe Jimeveryone belongs. I asked Gottlieb if she would answer some questions for me about these past two years and where she thinks things are moving forward. Her voice is the best way to describe what has been happening in her home. Yet, before we hear from Gottlieb, I want to share this one anecdote. Last week, I was able to join Karl and Cara Rosean of Real Time Farms at a presentation they gave for Food Tech Connect in New York City. The mavens of the tech food world were there to listen to them speak. One of the participants noticed that Selma Cafe is listed on Real Time Farms as one of their locally sourced restaurants. Then the entire room of 30 people began talking about what a fabulous and amazing institution Selma Cafe is – it was exhilarating and I felt very lucky to live in Ann Arbor. According to your blog archive, the first breakfast "cafe" took place on Feb. 27 to organize future breakfast "cafes." What gave you the idea in the first place? The first breakfast was on Feb. 20, 2009, and it was a casual breakfast to celebrate Jeff's 50th birthday. It was such a high-energy party, and people were so enthusiastic, that afterward a small group of people met to discuss the viability of continuing the breakfasts each week. Jeff and I decided that as long as we had volunteers to help, we would continue to open our home, and create a manageable way to find chefs each week and source local food. How long did it take for a regular routine to be developed with sufficient volunteers? We decided pretty quickly that we would do the breakfasts every week, as opposed to bi-weekly, or once a month – to avoid confusion. As we moved forward, and the workload became apparent, we needed more volunteers to take over some of the chores that got to be too much for us. For the first month or so, I was coming home after work to a pretty messy kitchen, and I was doing a lot of extra cleaning every Friday afternoon. And, the more the number of guests increased each week, the more need there was for extra servers, a steady dishwasher, people to clear plates and set tables and an expediter to make sure the food orders were going out to the right tables. We started out our first few weeks with 35 guests, then 50, then 75 and then 150. Our highest so far was 186 guests in December of 2010. In December of 2009, we were really needing more volunteers than we had. One week our chef was making breakfast, and no servers showed up to volunteer. So, we had guests fill out their own meal tickets, and when we called their name, they'd come get their order. The dishes piled up, because the dishwasher had to leave, the tables weren't being cleared, and it was a good bit of chaos. It was pretty obvious to everyone that without volunteers, Selma Cafe was not going to happen. A core group of us sat down, and we sent out an email, and we basically said if we don't have enough volunteers by Wednesday of each week consistently signing up, we'll have to stop Selma Cafe. And that was all it took. Since then, over a year ago now, we haven't had any problem with a lack of volunteers. Since this is a University town, volunteers come and go, but we love having volunteers who commit to taking on a role consistently for a period of time, since it means we have less training to do, and it's easier to give really great customer service when people are encouraged to own their volunteer role. These past two years, what elements of the "cafe" have been the most fun/exhilarating? Nearly all of it is fun. If there wasn't fun and joy and enthusiasm and energy, we just wouldn't have the juice to keep it sustainable week in and week out. A couple of my favorite fun things lately have been the addition of live music from various artists and the massage therapists who come and give complementary massage samples to our guests and volunteers. I love it when we are really busy, and there is this wonderful, happy energy in the house. There is the sound of people laughing and talking and connecting with each other. And the chefs are in a groove, and the food is coming out fast and hot and beautifully plated and delicious. And there's music, and the smell of waffles cooking, bacon frying, and fresh ground coffee. And folks are hugging each other, and babies are being passed to open arms, and kids are kissing their parents good-bye and heading up to Eberwhite to school. And then it's somebody's birthday, and I cut a little slice of bread pudding and put a birthday candle in it, and everybody stops for a moment and sings to that person, and it's just the sweetest, exhilarating feeling, all of that combined. And it happens pretty much that way each week. Most people I speak to are in awe of your willingness to open your private home to strangers on a weekly basis. Has your relationship with your home changed these past two years (i.e. does it still feel like home)? We've always had a lot of activity in our home, with people staying with us and coming and going. Jeff and I are pretty gregarious, and our kitchen and dining room are really set up to have lots of people cooking and eating together. Our rule is that no one goes upstairs –Â the upstairs is our private space, and that works pretty well. You know, we have the house to ourselves all week, except for Thursday evening and Friday morning. It still feels cozy and lovely to us. We are so lucky to have our own home, so why not share the abundance? Sometimes things get broken or put away in the wrong place, but those things are pretty minor when I look at the big picture of what Selma Cafe is accomplishing. What is your vision for the next two years? There are several big projects that we are working on. Jeff received a grant from the USDA to create an incubator farm program which is currently in the works just north of Ann Arbor, and we are planning a 20 Hoops in 20 Days event for this summer, which will include building 20 hoops starting June 15, finishing up on the 4th of July with a big party celebrating Independence Day by focusing attention on creating independence from big corporations controlling our food supply. We are funding those hoop builds with breakfast funds but also from our recently developed Farmer Fund, an investment fund managed by Ann Arbor's University Bank, where people can invest in our hoop house projects and earn a bit of interest while supporting our local farmers. I've been working on a Selma Cafe cookbook and hope to have that available sometime in the future. As far as the weekly breakfasts go, the plan is to keep the food coming every week, while offering lots of events for folks to get involved with our area's local food adventure. Anything you would like to add that I have not specially asked about? I am very proud of our accomplishments, like the nearly dozen hoop houses we've built, and the two years of weekly breakfasts we've provided, but just as meaningful to me is the environment we have created of inclusion, appreciation, physical and emotional safety, and the value we place on finding a spot for everyone, regardless of their skill set, to take part in our activities. As a social worker and yoga teacher, my view is that it isn't enough to be productive if the work we are doing doesn't reflect in the positive experiences of people involved in what we do. A good part of our mission is to build community, affiliation, and connection in our modern world, which tends to separate people into virtual, surface level connection. I want to focus on giving people opportunities to prepare and eat good food, to getting their hands dirty in the soil, planting and harvesting vegetables, learning to swing a hammer and work as a team with others, and have their over all experience be that they know the work they do has a positive, measurable influence on their daily lives. Thank you Lisa Gottlieb and Jeff McCabe for what you do! Thank you Anne Savage for the use of your beautiful photographs! I returned Wednesday to Ann Arbor from a week away. I left town with snowdrifts and nary a sight of grass or earth anywhere. I return to puddles, calcifying stalagmites of gray snow forms and soil once again visible in our back garden. The soft breeze and the smell of warming earth enveloped me on Thursday as I went out to open the coop for the chickens. Happiness I felt, and happiness I want to share. Given the state of the weather and my girls’ unwillingness to venture onto deep snow, there had been very little happiness these past few weeks in the flock. One gets a whole new appreciation for the term cooped up when you open the door to a coop that has been lived in 24 hours a day for weeks at a time. Usually our girls are outside during the day, but not when there is snow on the ground – they don’t like walking on deep snow because their legs are so short. Our girls knew something was different today. Instead of clustering on the spilled sawdust around their coop door, they all paused – heads high, beaks in the air. One ventured onto my path of trodden snow towards the dirt closer to the house, and, suddenly, a fluttering barrage of feathers and flapping wings launched themselves towards the soft wet earth. It was a struggle to tear myself away from watching their evident contentment and thrill at being able once again to scratch and dig into earth not covered in snow. One girl took such obvious pleasure in burrowing into the soft warming soil, I could almost feel the nooks and crannies of my feathers being dusted by the earth. I know, being human, we have weeks of snow and cold ahead of us. Yet this week my backyard chickens were able to dig in the soil, the pendulum is swinging towards spring. Their clucking pleasure was a huge gift. I don’t imagine chickens have any sense of time. So for my backyard chickens, the moments of digging and bathing in the soil in our temporary respite from winter this week lasted for eternity. 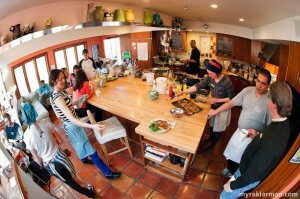 I recently took a raw food “cookingâ€ class (or raw food construction class) at Raw Gourmets International in Chicago. We spent the whole day pureeing, chopping, and dicing various vegetables and nuts to make ourselves lunch and dinner. In addition to changing the way I use my food processor, I have become emboldened to attempt previously out of reach culinary arts thanks to the class. In the raw food class we learned a version of “tuna saladâ€ to go into the sushi roll. “Tuna saladâ€ involved pureed soaked nuts as the “meatâ€ to which we added minced celery, red onion, parsley, dill, sea salt, and kelp. I have simplified the “tuna saladâ€ into simply pureeing soaked nuts. The rationale behind soaking nuts before you eat them is much the same as soaking seeds before you plant them in the earth. According to my class notes, “the water neutralizes the enzyme inhibitors allowing nuts and seeds to be more easily digested.â€ Making a raw nut puree is literally just that, soaking the nuts overnight, and then pureeing them into a white mash in the blender. 1. Lay one sheet of nori shiny side down, using the back of a teaspoon spread the miso paste on a third of the nori sheet (closest to you). 2. 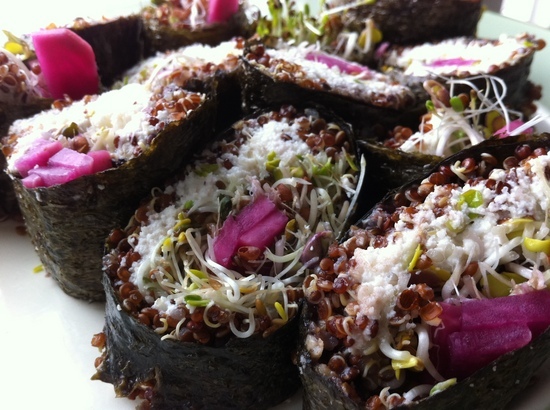 Layer quinoa, nut puree, sprouts, and pickles onto the area with the miso paste. 3. Tucking the edge in as you press down with your fingers, roll the nori sheet away from you tightly. You can seal the edge of the nori roll with a little water. 4. Cut the roll into 8 pieces. 5. Repeat with remaining nori sheets. 6. Serve with tamari or other dipping sauce. -	A freshly honed knife is required so that the roll does not collapse under the pressure and spout out the ends. -	Make sure the quinoa has absorbed all of the cooking liquid, or it will soften the nori to the point of collapse. -	The nori, nuts, pickles, and sprouts are all raw and thus full of digestive enzymes. Quinoa is a great source of protein. This is a great winter treat of color and vibrancy. -	Make a few rolls for your own consumption to gain proficiency with the technique before sharing this amazing treat with your friends. According to Human Rights Watch, the average speed of dead poultry moving past the inspectors in a slaughtering plant is 70 per minute. That means in the time it took you to read this last sentence you would have been expected to examine six birds for the nearly 20 listed items the Food Safety and Inspection Service list in their 2009 directive. Whether it be "pulling the cut skin and muscle back [to look for a] "yellow scabbed areas between the skin and subcutaneous tissue...enlarged or reddened kidneys that indicate infection of early sepsis, [or] ...an overscalded carcass." One second per bird is optimistic at best. 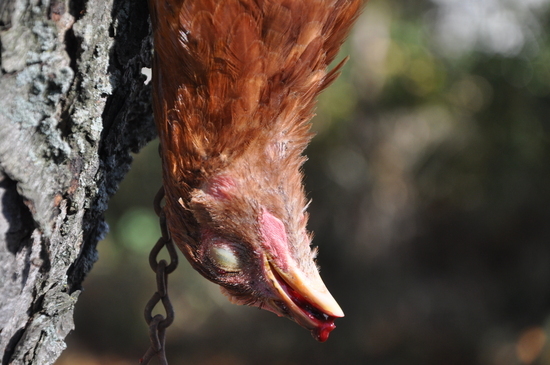 John Harnois, of Harnois Farms, was kind enough to teach us one fine October day he set up his metal funnel to hang the bird, a tub of water to scald the feathers and a de-plucking machine for after the deed was complete. After placing the chicken upside-down in the funnel, we grabbed its bottom jaw. Quickly before losing my nerve, I drove the point of a sharp paring knife through the upper soft palate into the chicken's brain. After watching the eyes slowly close, my husband took a pair of double-handed pruning shears and lopped off the head. Endemic in an animal designed to perch in trees not wade in water, Muscovy ducks have about 18% fat as opposed to Pekin duck with 29% fat. This fat difference and the less significant oil gland in the Muscovy alters the flavor of what our taste buds recognize as "duck" and can complicate cooking Muscovy for those not familiar with the meat. 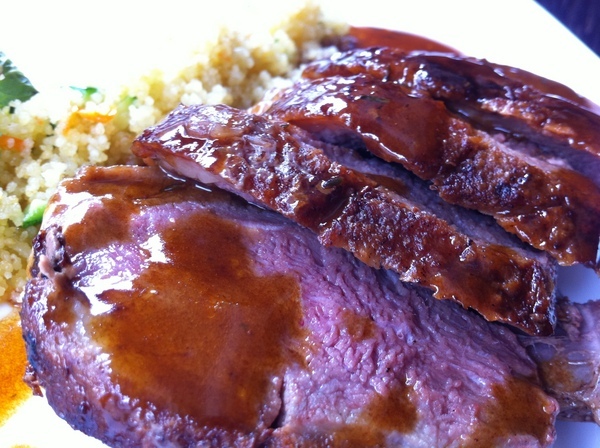 Recently, I was able to try Muscovy courtesy of ici Urban Bistro in Washington DC. The consensus at the table was that the meat was “absolutely fabulousâ€ and unlike anything anyone had eaten before - a bold, unique flavor arising from a texture that crumbled like veal, unlike poultry’s striation. I was also able to see firsthand the difficulty of cooking Muscovy. When the breast slices arrived to the table they were medium rare and succulent. By the time we finished eating the meat (20 minutes later?) the slices were cooked through from the residual heat. The flavor was still there but the texture was dry and unappealing. Beemer and Benjamin are planning to hold a Muscovy dinner in the Spring. If you are interested, contact David Beemer at OmniUnum Farm or Antoinette Benjamin at Food for all Seasons. You never know who you are going to sit next to at FridayMorning@Selmas, or in my case, who will sit on you. I sat next to David Beemer, of OmniUnum Farm, and Antoinette Benjamin, of Food for all Seasons Catering. As they spoke to me about the world of the Muscovy duck - two day old Muscovy ducklings nestled their warm, downy, wiggling bodies into my neck, tucking themselves in under my hair, as if I were their mama. After such a bucolic introduction, I had no choice but to visit the farm. A former investment banker and hospital administrator, David Beemer changed the trajectory of his life after experiencing a health scare while working in Namibia. He left his desk and began raising his own food. “When I first got out here…I put like, 800 pounds of cow manure and Michigan Peat in my asparagus bed. And I just said - this is ridiculous. It can’t be this tough - and that is how I first got into poultry.â€ Beemer attributes his thriving vegetables to regularly fertilizing his garden with duck pond water and soiled straw from his fowl charges. 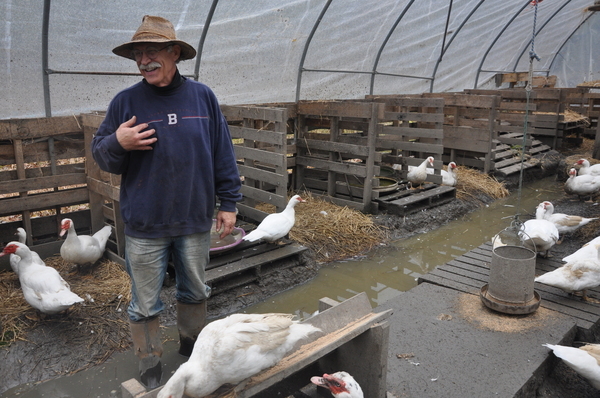 Beemer began his Muscovy flock with 18 ducklings from Quaker Hill Farm three years ago. The ducks have a varied diet: including vegetables from the gardens they fertilize, organic crumble, kelp tea, comfrey, worms, fruit, algae, and insects they forage themselves. Beemer has constructed an “annex, an aviary, a spa, and a playgroundâ€ for the birds out of recycled items from Craig’s List and diverted a small drainage stream and natural spring in order to ensure a constant supply of fresh water to the flock. His 12,500 foot enclosed area is tall enough for the birds to fly. 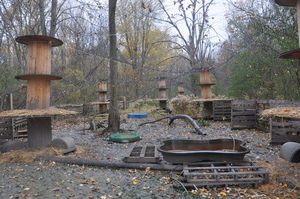 Beemer constructed a "playground" for his flock out of recycled items, in line with the principles of Permaculture. (In the video you can see the difference between a molting Buff Orpington and one with full plumage.) The chickens have been part of our lives for 17 months now. The patina of the unknown had faded into a routine. Thank goodness for Mother Nature. Just when I thought all was staid, she sends the message to our chickens: Time to molt. And wow, a molting chicken is a silly looking chicken. The first inkling that something was amiss began at the beginning of November. Though I was unsure as to why, we had been told to keep track of daily egg production by people we trusted. A few weeks ago, our numbers dropped off precipitously and stayed dropped. Three to four eggs a day became one. I am grateful we had been keeping track of production, because it put us on notice to be more attentive to their subsequent behavior. 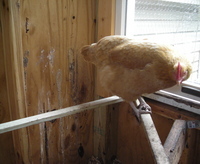 After a week of decreased production, more feathers were on the bottom of the coop than I had ever seen before. Our chickens also became highly skittish. Whereas before when we brought out treats, they would say hello – some of them even jumping up on shoulders and knees – now most stayed away. Diminished egg production and loss of feathers could indicate several fowl situations (pun intended). 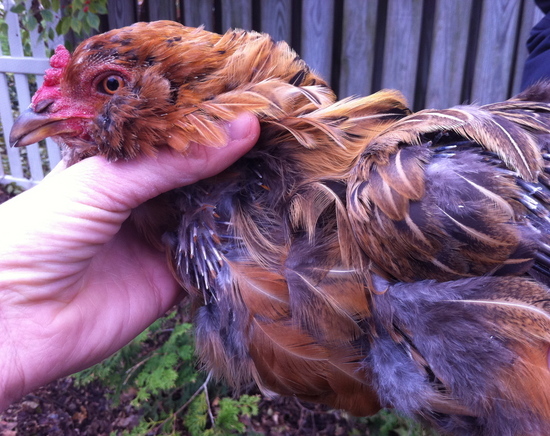 Mites, lice, poor nutrition, general stress or molting were all possibilities. Just when I had decided to read about mites, I was able to catch one of the skittish birds. Pullets are expected to produce eggs continuously for 11 months before taking a break to build up their bodies' reserves of nutrients. Our girls started laying in late December, so we were right at 11 months. Day length is certainly shorter. When I was able to catch a bird, I saw pin feathers coming out of her neck – a molt it is! Pin feathers look like short clear straws with tightly compressed feathers tufting through the very top. “The first plumage is lost from the head and neck, then from the saddle, breast and abdomen (body), then from the wings and finally from the tail,â€ according to the Australian Farmnote. As we watch for our birds to pass through the stages of molting, we are reminded of our initial adoration for our backyard chickens. It's probably good for us to take a break from eating eggs anyway. In my Farm to Fork series, I visit local farms and share what I learn. 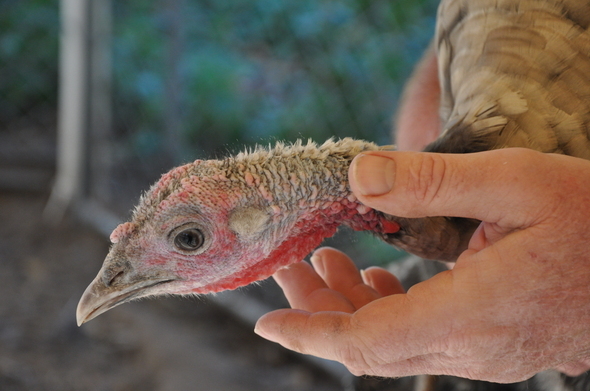 As I mentioned in my overview of Harnois Farms, John Harnois raises heirloom Narrangansett turkeys. He raises them, because, as he so succinctly put it, “You gotta eat ‘em to keep ‘em alive. If you don’t eat ‘em the genetics are going to be gone.â€ As signs abound everywhere for ordering Thanksgiving turkeys, a festival saluting their North American provenance, the time feels ripe to delve into the world of our gobbling domestic fowl. The head of a Narrangansett hen held by John Harnois. The bulbous bumps called caruncles are clearly evident. If something happens, consumers will have a choice of eating beans & rice or paying three times as much for a turkey. Broad Breasted Whites are cheaper to raise than the 8 breeds of heritage turkey listed on the American Poultry Association’s turkey Standard of Perfection for recognized breeds (Slate, White Holland, Bronze, and Narrangansett have been on the list since 1874). Bred for a fast turnaround on your initial investment of around $3.50 per poult, the birds have white feathers (which means if the developing pin feathers release pigment when plucked the skin is not stained), and grow to maturity in around 20 weeks. Inefficient they may be, but it is clear that Harnois enjoys every moment of his time with his turkeys. Cradling one against his body he strokes the head as he describes the anatomy of the bird. 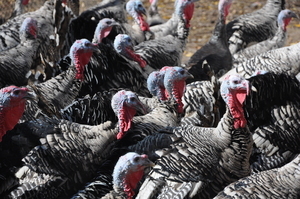 A practiced yodeling gobble from Harnois elicited a chorus of gobbling from the Broad Breasted Whites in return. The Narrangansetts then responded to the Whites, for a call and response of back and forth calls between the birds. Proponents of the “eat ‘em to keep ‘em aliveâ€ camp extol the flavor of the heritage breeds, especially the dark meat. Harnois and Morgan & York sell their heritage turkeys for $10/pound - and are sold out. There is rapidly diminishing availability through the Heritage Foods website (www.heritagefoodsusa.com). Whole Foods is not selling heritage breeds this year because there was not enough demand last year. John Harnois can be reached at 734-645-0300 or harnoishappyhens@gmail.com. In my Farm to Fork series, I visit local farms and share what I learn. John Harnois, of Harnois Farms, has been raising free range, hormone-free, antibiotic-free poultry for more than 15 years. Roosters crow, turkeys gobble, ducklings peep and geese cackle - a chorus of sound and movement welcome you to his farm. Harnois began his poultry farm in the spring of 1994. Harnois two main expenses are the premium prices he pays for heritage breeds - “I think that heritage, these heirloom varieties that I have, lay a more flavorful eggâ€ - and the food he feeds them. All Harnois poultry - the ducks, the chickens, the laying hens, the turkeys, the geese - eat the same feed, the recipe for which he tracked down from a mill that went out of business. Harnois feels the lauded flavor of his eggs and meat is courtesy of this unique blend of grains and beans - a feed that is rapidly becoming more expensive. Some argue the demand for U.S. soy is due to traders purchasing domestic soy to sell on the more lucrative Chinese markets. “China will increase imports by 23 percent this year, partly to feed hogs as pork consumption rises,â€ reported Bloomberg. On Nov. 2, Bloomberg reported that due to a high rainfall in South America, the price for soybeans “leveled offâ€ at $12.34 a bushel and $5.9075 for corn. According to USDA data, compared with last year, the price of soybeans this year has increased by 26 percent (from $9.76) and corn by 49 percentÂ (from $3.95). At the end of the day, this global marketplace is setting the price of feed for the ducks, chickens, geese and turkeys that scratch, peck, preen and gobble on Harnois farm. As the price of feed rises, so does the price of eggs and meat - as Thomas Friedman says, it is a flat world. John Harnois attends the Ann Arbor Farmers Market which will give you your chance to talk to him about duck eggs, chicken eggs, succulent chicken, tender turkeys, etc. 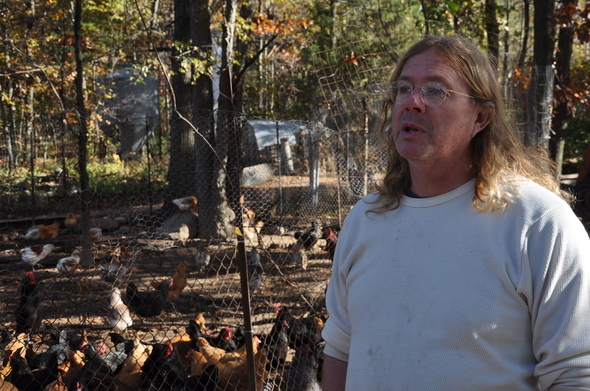 His chicken eggs are sold at the People’s Food Co-op and his meat and eggs are sold at Arbor Farms Market. CafÃ© Zola sources 90 dozen Harnois eggs a week, and Grange Kitchen & Bar often sources meat from his birds.